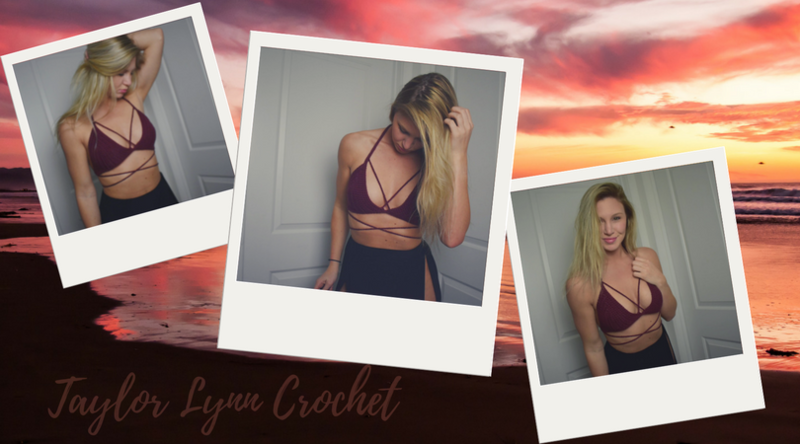 X Bikini Top Crochet Pattern – FREE! Is there still snow on the ground here in Michigan? Absolutely. I’m not in denial, I promise, its just that I have sunshine, beaches, and warmer weather are on my mind. I have a Vacay to a warmer place coming up soon(ISH), and I wanted to make a new bikini top to be ready for all the warm weather that awaits me. This top was inspired by a swim top I saw at the beach last year, and I couldn’t get those cute little criss-cross straps off my mind. 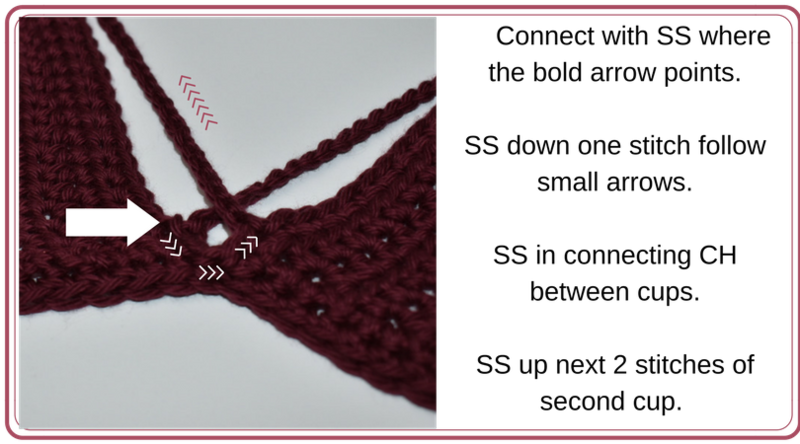 This bikini top is a pretty and simple design, using basic stitches, so confident beginners/intermediate crocheters should be able to handle this project with ease. This bikini top could be made in any color and it will be uniquely yours! 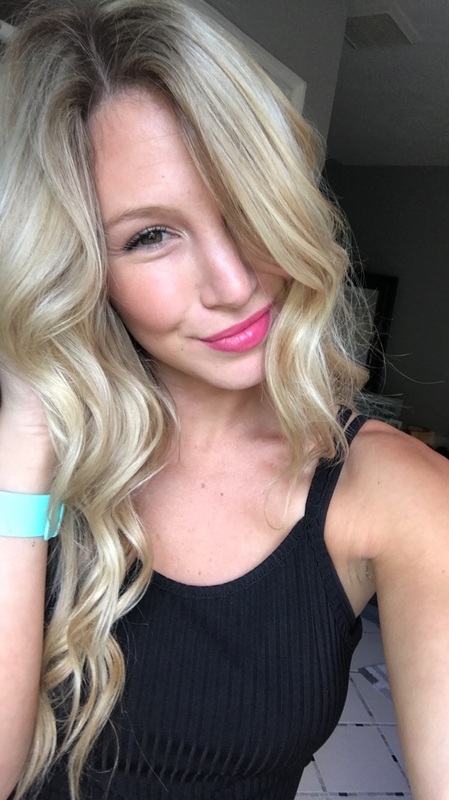 I would love to see how your finished projects turn out! Tag me in your finished projects or even if its still a work in progress and I may feature your project on my social media accounts! If anyone has a suggestion for any new patterns feel free to tag me or DM on my instagram at anytime. Also if you get stuck on a pattern at any time, just find where I posted that pattern photo on my Instagram and leave a comment with your question. This allows me to know exactly what pattern you are asking about, and it may help out someone else so has a similar question! I will respond as quickly as I can. Thanks loves! Buying Crochet Supplies Pro Tip: If you purchase any of your craft supplies at Joann Fabrics like I often do, then you should really consider getting the Ibotta App on your phone. They have cashback coupons for Joann’s as well as other cashback opportunities on certain yarn brands like Big Twist. They also have lots of other retailers on there but I pretty much only use the Joann rebates. I have gotten almost $100 back from just buying things I would have bought anyways by scanning my receipt in the Ibotta App. You can have the money sent to your paypal or use it to get gift cards (Joanns, Applebees, etc). Yarn: I used about half a skein of Hobby Lobby’s I Love This Cotton in the color Aubergine. Crochet Hook: I used a 4mm Hook (size G). You could use a 3.75mm hook for a tighter stitch as well. Scissors: to cut your yarn. The scissors below are the ones I use and keep in my crafting bag. They are super sharp and compact enough to carry with me and my projects! 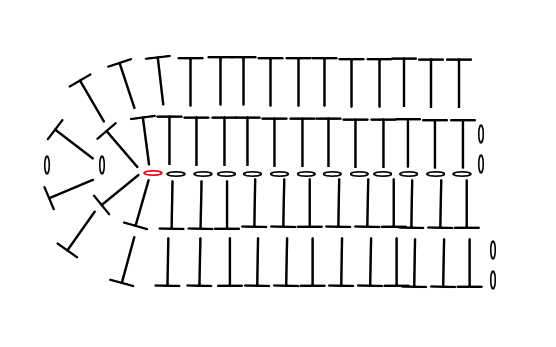 Chain 1 Space (ch1sp) – The space in the row before where a “bridge” was created by one or more chains. 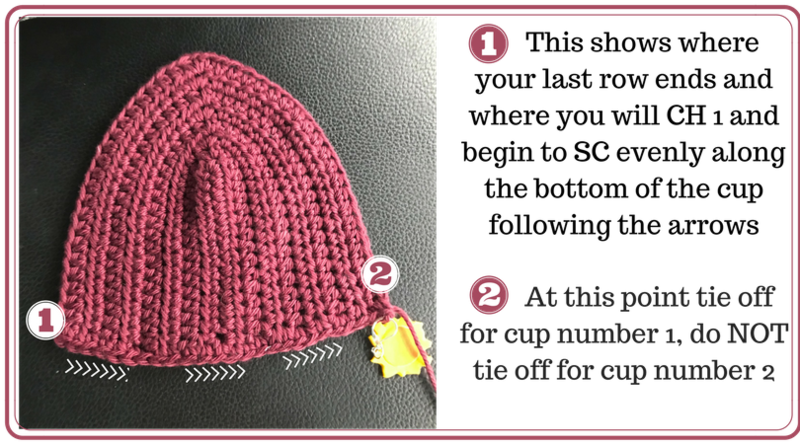 Half Double Crochet (HDC) – YO and insert hook into next chain/stitch and YO and pull back through the Chain/Stitch. YO and pull through all loops on hook. To make the top smaller or larger than the pattern suggest for a better fit, feel free to adjust the size of the cups. To make it smaller you can use 1-2 less beginning chains (this will decrease the height of the cup) or do one less row when making the cups. For a larger size, you can add a few more chains to the beginning chain (this will make the cup taller), or add a few additional rows for more coverage (this will make the cups taller and wider). Tie on your yarn to your hook. Row 1: HDC in 3rd Ch from hook and HDC across in each CH. In the last CH do 2 HDC, CH1, and do 2 more HDC in the same CH.Now on the back side of the CH you will do HDC in each CH until you reach your first starting Chain. Below is a chart showing how you will work the first 2 rows. The Red Oval symbolizes your first chain. 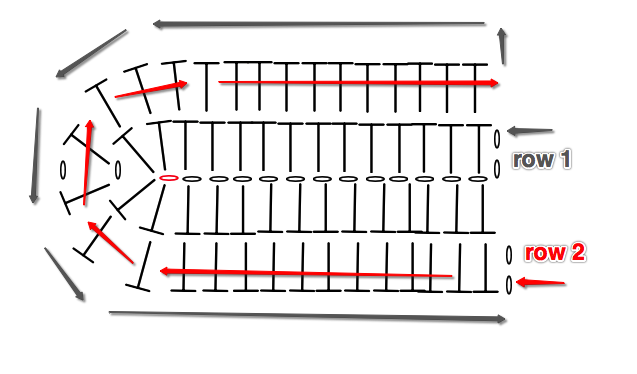 I added arrows to help beginners get a better understanding of how these rows will be worked. If this still confuses you check out my Festival Crop Top Tutorial with step by step photos that walk you through working into the back of the chain to make the cups for a bikini top. Row 2: CH 2 and turn (this does not counts as first HDC). HDC in the first stitch and in each ST from the previous round until you get to the CH1 space in previous round (you should have made 14 HDC at this point). In that CH1 space, HDC, CH1, HDC and then continue with 1 HDC in each ST along the back side of the round. ** You should end up with 15 HDC on each side of the U shape with one CH1 at the peak of the U. Row 3-8 (rows 3-7,3-9): Repeat Row 2. 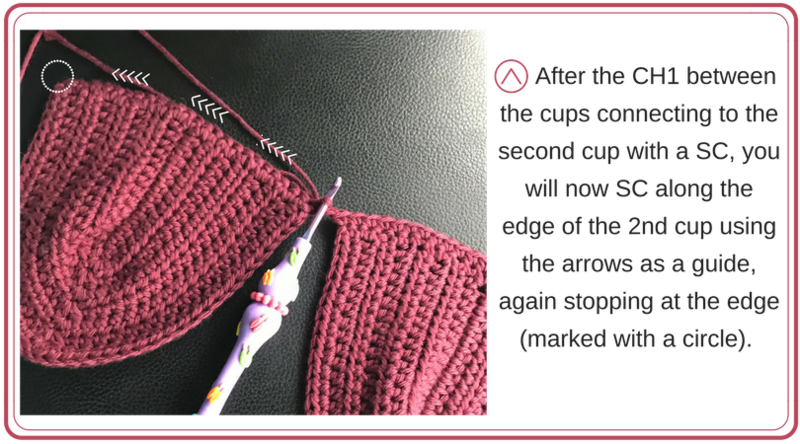 **This will be the size of your finished cup for the most part so to add more coverage feel free to add an additional row, OR do one less row for a lower-coverage top. Repeat: Tie off and repeat exactly for the second cup but DO NOT cut and tie off at the end of the second cup! Now you have the cups for your crochet bikini top! Half way there! 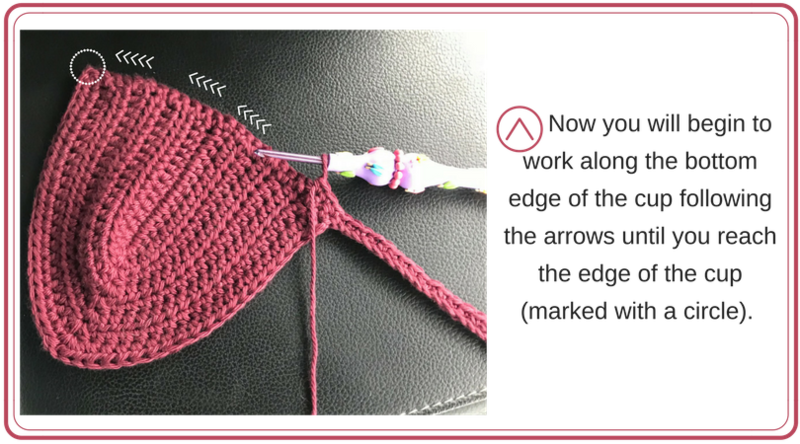 You should now be on the second cup of your crochet bikini top and just finished doing your row of SC’s along the bottom. If you accidentally tied off on the second cup, thats okay. Just tie back onto the last SC you made at the end of the cup. Side Strap 1: Still tied on where you left off on the second cup, CH 82. Turn and in the 2nd CH from the hook SC. SC in each CH until you again reach the first CH you made. Now, you will SC in each ST along the bottom of the cup until you reach the opposite edge. Use the graphic below as a guide. CH1, and connect to the second cup with a SC. Continue to SC along the bottom edge the second cup until you reach the opposite corner of the cup. Use the graphic below as a guide. ** for a larger space between cups you can add an additional CH or 2 here. Just know that 1 or 2 chains can make a big difference on coverage of your top if you choose to do so. For a closer fuller coverage top you can skip the CH 1 and connect right to the second cup. Girls with smaller chests may prefer to go this route. CH 82, and turn. SC in the 2nd CH from the hook. SC in each CH until you again reach the edge of the cup you started at. Connect to the edge of the cup with a SC. SC in each ST along the side edge of the cup until you reach the peak (where the CH1sp is located). This is where you will begin the make the neck strap. Neck Strap: CH 80. SS in each chain back down the strap until you reach the top of the cup. SC down the inner edge of the cup, making one SC in the CH between the cups before continuing to SC up along the inner edge of the second cup. Neck Strap 2: Again CH 80 and SS in each CH back down the strap until you reach the top of the cup again.SC down the outside edge of the top until you reach your first back strap made and tie off. Tie onto the point of a cup (doesn’t matter which one) and SS up 3 stitches of the neck strap. CH 29 (27,31). 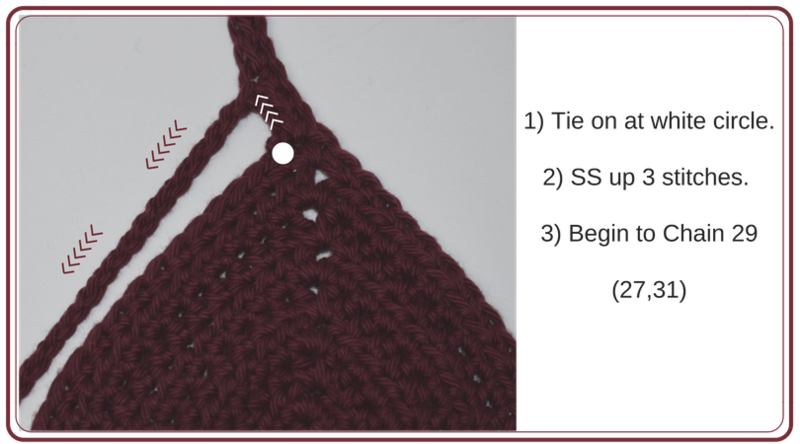 ** you may find you have to adjust the length of this chain depending on how tightly/loosely you crochet. After you connect this strap in the next step hold it against yourself and make sure the top can easily lay flat without pulling, but that the CH strap you made is also not hanging loosely and adjust by adding or deducting 1-2 ch’s accordingly. CH 29 (27,31). Connect in the 3rd ST up from the point of the cup on the neck strap making sure the CH is not twisted (you want it evenly placed to match where your CH starts to come down on your first strap). SS down the next 3 stitches towards the point of the cup. SS to top of cup and tie off. Tie onto the bottom outer corner of either cup and CH 130. Tie off and repeat on other side. That is it! You will tie the neck and back straps normally, and then the last two straps you made you will cross across your front before tying them in the back. I always try to be PUNny, but it never works. Oh well, can’t win them all *insert shoulder shrug*. I hope you all finished this bikini top in time for warmer weather so you can rock this at the beach, a concert, or wherever your queen hearts desire. I tried adding more photos for you all this time around, but please don’t hesitate to reach out! Follow me on Instagram to see what I am cooking up next! If you have ANY QUESTIONS about this crochet bikini top pattern, or anything else on my blog or about anything please please leave me a comment below and I will get back to you ASAP! Also, if you would be willing, I would love for you to share your finished projects (and you wearing them out doing fun water things!) on my blog’s Facebook Page! Thank you so much! If you have any suggestions for future projects or tutorials please comment below! 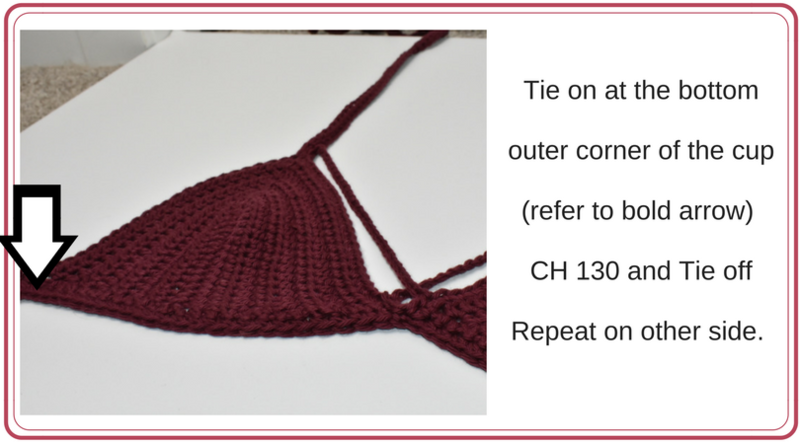 5 Comments on X Bikini Top Crochet Pattern – FREE! G hook is 4.25mm right? That could possible be correct, but my clover hook stated it was a 4mm and a G, but maybe each letter has a range? A 4.25mm hook will definitely work either way! Crochet hook G is 4.00 mm, hooks 4.00 mm and above do not come in quarter sizes. For example you will see hook sizes like 3.25mm and 3.75 mm. When you reach the 4.00 or above they will range in half sizes, such as 4.00 mm, 4.50 mm, 5.00 mm, 5.50 mm, 6.00 mm etc. thank you for sharing. Your clear explanations are a dream!